It may be 20 degrees outside, but it's 84 degrees inside Breaker Bay Waterpark at Blue Harbor Resort and Conference Center. Grab your bathing suit or put on your favorite luau shirt. Pack up the car and get your family out of the house. Have some fun. Meet other families. Make a splash! Surf, slide, soak and swim. See it all HERE. -Wristbands are required for entrance to the waterpark. -Children under 12 must be supervised at ALL times. -There is NO running in the waterpark. -State law prohibits the use of glass, coolers or any carry-in food while in the waterpark. -NO smoking in the waterpark. -Please shower before using the waterpark. -You may get wet while in the waterpark. Dress accordingly. -Do not bring toys into the waterpark. -All waterpark guests must follow each and every ride instruction, which may include height restrictions. -A private room will be available for those who want to socialize and eat with other families. -Adult beverages are available for purchase at the waterpark. -For guests that don't want to swim (spectators), but would like to enjoy the waterpark experience with their families - remember to pack a cool t-shirt and shorts to wear while in the waterpark, which is consistently at 84 degrees. 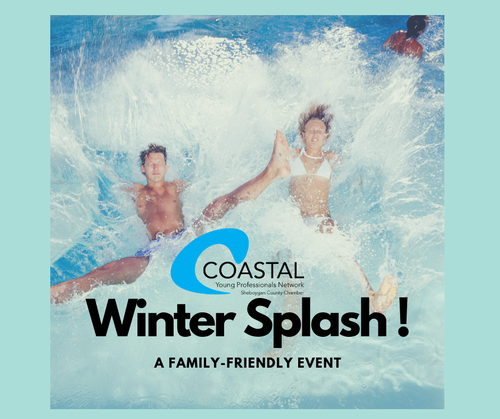 12:00 Noon to 4:00 p.m. - Coastal will be on site at the waterpark from 12:00 Noon to 4:00 p.m.
4:00 p.m. to 9:00 p.m. - You are welcome to continue having fun until the waterpark closes at 9:00 p.m.; however, Coastal representatives and Chamber staff will not be on site after 4:00 p.m.
**Meal vouchers are valid for your choice of one hotdog, hamburger or cheeseburger, a bag of chips and a small soda from the Rocky Bottom Snack Bar. Children 2 and under are free - NO meal vouchers included. REGISTRATION DEADLINE IS Feb. 19, 2019 at 10:00 a.m.